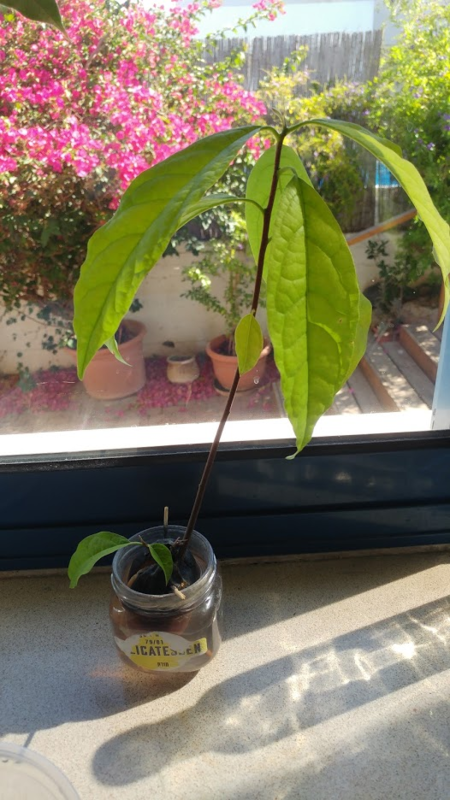 Is it possible to know if a small avocado plant is going to be a fruitful tree? I started growing an avocado pit, which grew very nicely until now. I was wondering if there's any way to know if it can become a fruitful tree - if so I'd like to plant it in my garden, but if it doesn't - I prefer not to. The avocado was bought in a supermarket and I'm pretty sure it was a reed (if that matters), but not 100% sure. Most avocado plants are hybrids and seeds will not necessarily come true from seed. Fruit could be better, worse or the same. Also, avocados are large trees. Your chances of getting a crop from a plant in a pot grown inside are not very good. If you search for avocado on this forum you will see many very sad looking plants. They do not do well inside in pots over the long term. Light levels are too low and there is insufficient space for the roots. If you can plant it outside and you are in a tropical climate and can wait five to seven years then it should start fruiting. Not the answer you're looking for? Browse other questions tagged growth avocado or ask your own question. How to prevent avocado from drying out indoors? What is happening to the leaves of my avocado? Avocado… help my girl go down the right path! Will my basil plant regrow without leaves? What do I do with my avocado plant during arctic winter? Why would cuttings from the same hibiscus exhibit different growing behaviors? Help needed to repot my 42" avocado tree in my apt please! How to help an avocado plant recover from plant transplant shock?